VapeOnly eGo USB Battery, is an eGo series battery, featuring with novel and practical battery with the flashlight and USB passthrough function. Simple and elegant surface gives you marvelous vapor experience. 4 colors available. VapeOnly eGo USB Battery, is an eGo series battery, featuring with novel and practical battery with the flashlight and USB passthrough function. Large power volume ensures long time vaping. The 5-click ON/OFF function makes it safer and easier to use. Simple and elegant surface gives you marvelous vapor experience. 4 colors available. Flashlight Mode: Press the button for 5 seconds when the battery is in off status. Then white light blinks, release the button and click again within 3 seconds to start the flashlight. To turn off the flashlight, you can press the button for 5 seconds to enter off status or click 5 times within 2 seconds to enter vaping mode. 5-click ON/OFF function: Quickly click 5 times in 2 seconds will turn on or off the battery. This safety feature prevents the battery from turning on while it’s in your pocket or bag. USB PASS-THROUGH Function:It can work as a USB pass-through device for simultaneous vaping and charging. 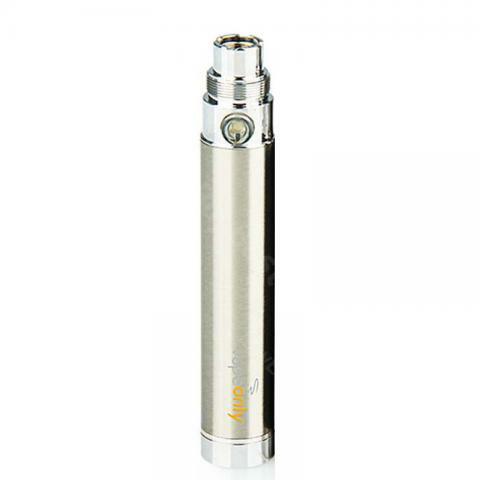 Atomizer Protection:If the activation button is held for 14 seconds or longer, the battery will shut down automatically. You need to click 5 times to turn it on. Short Circuit Protection: If atomizers come with short circuit, the battery will be shut down after white light blinks 5 times. Low Voltage Protection: When the battery voltage is lower than 3.3V, the button will blink 10 times with red light to inform that the battery needs to be charged. After that the battery will enter power saving mode. Over-charge and discharge Protection: The battery will automatically stop charging when the charging current exceeds 3A or voltage exceeds 4.275V. Besides, the battery will turn off when output current exceeds 3.5A or voltage is lower than 2.5V. Over-temperature Protection: When the temperature is over 120 degrees, the battery requires recharging activation to release from battery self-protection. Constant Output Voltage: It supplies constant 3.7V output voltage. You can choose aotmizers with different resistances to get better vapor. Smoking Lock and Unlock: If you inhale 5 times within 3 seconds, the battery will turn off after LED blinking 5 times. You need to click 5 times or recharge it to turn it on, which protects it from mis-operation. Simply connect the battery to a standard USB output port through the Mini USB cable. The LED will turn red to show it is charging. When the battery is fully charged, the LED will turn off. The LED will show vaping status if you press the button while charging and the LED will return to constant red light to show charging after 3 seconds without operation. • 650mAh, 1100mAh and 1600 mAh available. VapeOnly eGo USB Pass through Battery this is one of VapeOnly batteries. This product have a range of capacities from 650mAh, 1100mAh to 1600mAh. It is available in different colors.